Learn how to deploy your first Drupal 8 site on OpenShift. We saw the business value of running OpenShift in the last post. Now we will look at how to build and deploy your first Drupal 8 site on OpenShift. Download code used in this post. First, we have to understand the relationship between Docker containers and OpenShift. They are still the fundamental units of an OpenShift cluster but are abstracted out by an entity called Pod. A pod is a collection of containers which share the same port space and IP address. 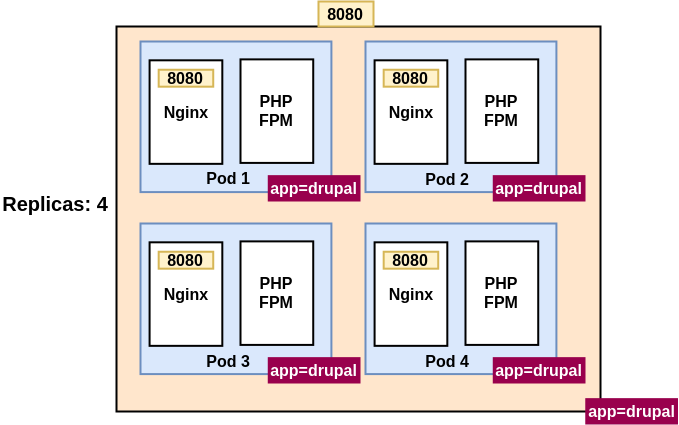 For instance, in a Drupal context, a pod will contain an Nginx container and a PHP FPM container running inside it. A pod stays true to the unwritten dictum of containers, i.e., only 1 process per container. We will build 2 containers, one for Nginx and one for Drupal. This container will contain Nginx and the related configuration required for our Drupal site. I’m currently assuming the “/web” directory to be the top level directory according to Drupal convention, but this can be changed in the Nginx configuration file before building the image. It will run Nginx as a non-root user. This is a mandatory security practice if you want to run your container in an OpenShift cluster, unlike Kubernetes. The default and only Nginx configuration will be the one which supports running a Drupal 8 site. A non-root user cannot run Nginx on port 80. Hence, we will run Nginx in an unconventional port, i.e. 8080. Let’s build and push our Nginx container to the public docker registry. $ docker build -t lakshminp/nginx-openshift:1.0 . All the required prerequisites to run Drupal 8, like PHP 7.1 and its dependencies. We can do this in one of two ways. The first way is to build our container in one go and in the last step, add our source code and run composer. The other better way is to build a base image with everything except the most frequently changing part, i.e. the source code of your Drupal application. Then, we will use this base image to build the final container with the source code and composer dependencies injected. 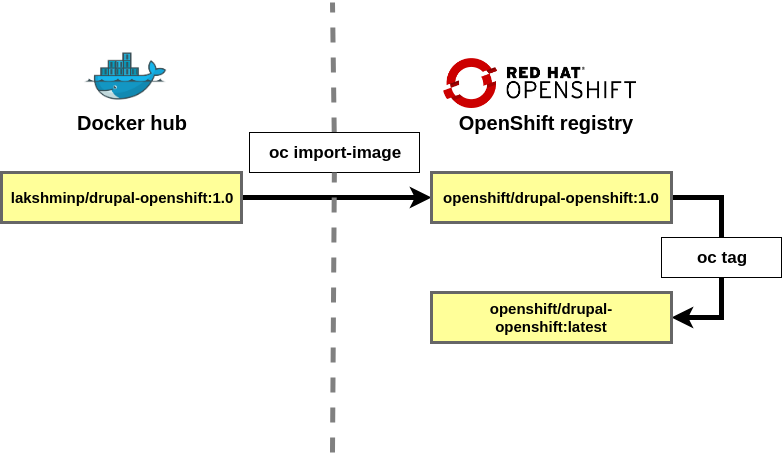 This will also help us conceptually understand a feature of OpenShift we’ll use later, called source 2 image. # This is where the source code will be cloned. # Drupal files directory will map to this. You can see that we create “/app” and “/code”. We will eventually move the code from “/code” to “/app” at the time of deploying the containers, as this will be a commonly shared volume between Nginx and the Drupal containers. Let’s build and push this base image. $ docker build -t lakshminp/drupal-openshift-base:1.0 . Now, injecting our source code on top of this base image is fairly easy. It uses the Drupal composer project file structure. The docroot is “/web”, you can customize this, but for now we’ll stick to this. You need to make your code more 12-factor compatible. Once you’ve done these, you can build and push your final drupal container. $ docker build -t lakshminp/drupal-openshift:1.0 . We’ve so far created 2 docker images for each of our containers, but haven’t actually deployed them to our OpenShift cluster. We need a functional cluster for that. The quickest way to create a bare minimal cluster is to use Minishift. You can install Minishift in your favorite OS and start using it instantly. There are other slower but better ways to create a cluster. Once you have the cluster setup, you can start deploying your applications instantly. A pod is a set of containers which share the same IP address and port space. In our case, the pod will contain a PHP FPM container running in port 9000 and Nginx container running in port 8080. A replicaset is a specification on how many copies of your pods should exist in the cluster. You scale up your web application by bumping up the number of replicas of your pod. A service is a resource which tags all replicas with the same configuration into a single entity. It also specifies which ports are exposed by your pods to the outside world. In our case, let’s say that we are running 5 replicas of the PHP FPM + Nginx pod in the cluster, we tag it as a “Drupal” service and expose 8080 as the only port. I’ll introduce a few new resources relevant to our context. The first one is secrets. Secrets provide a way to inject configuration and secret stuff(like passwords and API keys) into our app pods. In our case, we need a secret resource to furnish the database credentials of our Drupal database. The next resource type is a persistent volume claim or called by its acronym PVC. A PVC is a way to abstract out the storage of an app in a cluster. Most consumers of a cluster are developers, and they needn’t bother about the innards of storage. For example, let’s say that I want 100 GB of SSD storage in the “Asia Pacific” region of my cluster. I need to know the specifics of the storage apparatus, like the API key and other details. This is information which can’t be shared with all the developers. Instead, what OpenShift does is, it manages the storage for you, with the specifics managed by cluster operators. A developer just needs to give their preferences as to what kind of storage they want, how much etc. The just raise a “claim” for storage and it is the responsibility of the OpenShift cluster to allocate the claimed storage for them. Think of it as raising a request to your IT support department for 100 GB of SSD storage, albeit in this context, the IT support department is your OpenShift cluster. In our case, we need the MariaDB database to persist data, as containers are ephemeral otherwise. Let’s create a PVC resource for the same. The next step is to deploy this database in the cluster. We use a resource called DeploymentConfig. I’ll do a deep dive of this resource when we are deploying the Drupal container. That’s quite a mouthful. This essentially tells OpenShift to deploy an instance of the “mariadb:10.2” image in the cluster. A few things of note in this config. It consumes the secrets resource created earlier and injects those values as environmental variables into the MariaDB container. There is a “readiness probe” in the config which is a way of telling “Is my container ready yet to start consuming?”. In this case, if we can connect to the MySQL DB and run a sample query successfully, the container is ready to serve traffic. There is a “liveness probe” which tells whether the container is alive or not. In this case, OpenShift tries to establish a connection in the said TCP port, if it can do so successfully, the container is said to be alive and flagged as dead otherwise. This can even be an HTTP request to the app/service inside your container. Let’s create this resource in OpenShift. Lastly, we have to expose this MariaDB service to other containers in the cluster. To do that, we create a service resource type. and add it to the cluster. Our Drupal app also contains a similar list of resources. A persistent volume claim for storing files, the “sites/default/files” folder. A deployment config which contains how many replicas should be run, how the containers should be built etc. Let’s digress the Drupal deployment config in detail. What does a deployment config mean? A deployment involves creating replicas of the said container image in the cluster. These are called triggers and are a part of the deployment config spec. The above deployment config states that OpenShift will create 1 replica of a pod(comprising of PHP-FPM and Nginx containers). The PHP FPM will contain a persistent volume(/app/web/sites/default/files) and a deployment will be triggered if the “drupal-openshift” or “nginx-openshift” image changes or the replica count changes. Now, where does OpenShift get these images from? If you guessed dockerhub, you’re wrong. OpenShift provides an easy and consistent way to manage container images using its internal registry(in case you didn’t know, unlike Kubernetes, OpenShift runs its own per-cluster docker registry). You can tag external images using your own scheme inside OpenShift. These are called image streams. Image streams help you prevent a wrongful deployment, for example when an external image changes, thereby providing stability. Before we import our Drupal and Nginx images into OpenShift’s registry, we have to ensure we are logged in as the system admin user, a user with special privileges, like access to the “openshift” namespace. This is the namespace where are the standard images are stored in the registry. We import the nginx and drupal images from dockerhub. And tag them as the latest images. Now, instead of having a file for each resource, we can club all the resources into a single file and use it to deploy our app. What this says is to delete all the resources with the label “app=drupal-8”. Once we have a deployment config in place and a valid imagestream, we will have the Drupal and DB pods up and running in minutes. Similar to how a service exposes a pod to the rest of the cluster, a route is a resource which exposes a service to the outside world. Let’s verify how a new image automatically triggers a redeployment. The most frequent reason for a new deployment is pushing new code to your code base. As a simple example, let’s add a new module to our Drupal setup. $ git commit -a -m "Add token module"
Now, we build a newer image using the newly pushed code. $ docker build -t lakshminp/drupal-openshift:1.1 . This does not trigger any build so far, as I’ve created a new image in an external repository and OpenShift is not aware of it. The next step will be to import this image into OpenShift. 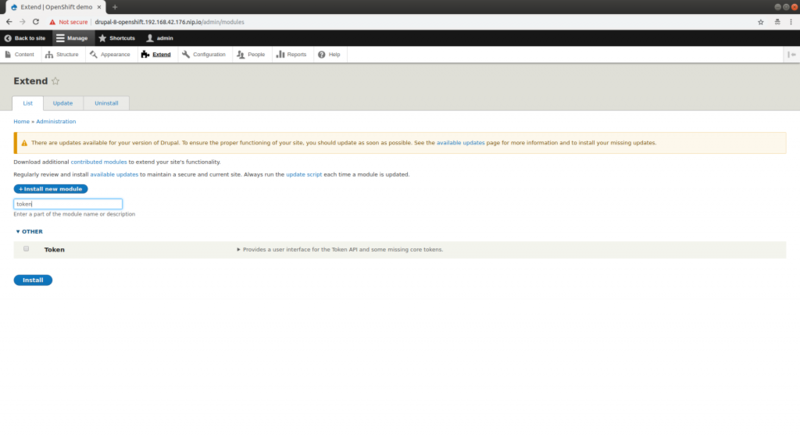 Our Drupal deployment config is triggered only when the “drupal-openshift” image with the “latest” tag changes. So, let’s tag the “1.1” version as latest. You can see that this will fire a deployment automatically. To verify that our new code has landed after the deployment is complete, you can inspect the module list and confirm that the token module is listed. Verify that token module is in code. You build and push your containers containing possibly proprietary code into a public repository like dockerhub. Not something you do in the real world. It is a hard requirement that your team needs to have some ops knowledge like building containers. Every time you want to deploy, you need to build a new image and push it to OpenShift’s registry. Though this can be automated(as a post-hook script or a CI step for example), we can make this workflow more seamless. Creating a new Drupal site involves manually editing the YAML files, which could be messy. Overall, it is not a good developer experience. We shall address all the above concerns and more in the next post!